There are a number of mixed hotel-apartment developments in the city's pipeline, but hotel-office ones? That's a first. Another boutique hotel is slated for the downtown San Antonio site at the corner of East Commerce and North Main, but local REM Hospitality is giving it a twist by incorporating office space and retail into the mix. The hotel development and property management company has closed on a 0.4-acre site north of the Cathedral of San Fernando and a block southwest to the future Frost tower. REM is moving quickly with plans for a new Choice Hotels International (NYSE:CHH) boutique hotel concept that will also include roughly 30,000 square feet of office and 8,000 square feet of retail space. Choice Hotels International recently opened a Cambria location in New York. REM Hospitality will be developing the first in San Antonio. There are a number of mixed hotel-apartment developments in the city's pipeline, but hotel-office ones? That's a first. 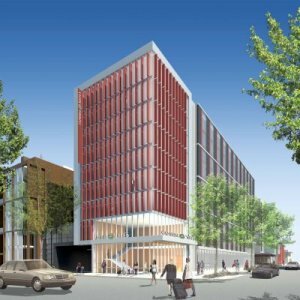 REM's CEO Pratik Patel said the decision came after talking with a hotel professional at a conference on the East Coast about how the next generation of workers all want to live in the central district and work in a vibrant downtown. "San Antonio's downtown doesn't have the appeal to draw young folks in, so how do you make downtown a business hub?" Patel said. And for him, this development is what he calls his "heritage project." REM "has never stamped ourselves in downtown, and this opens our eyes to other city center urban projects." 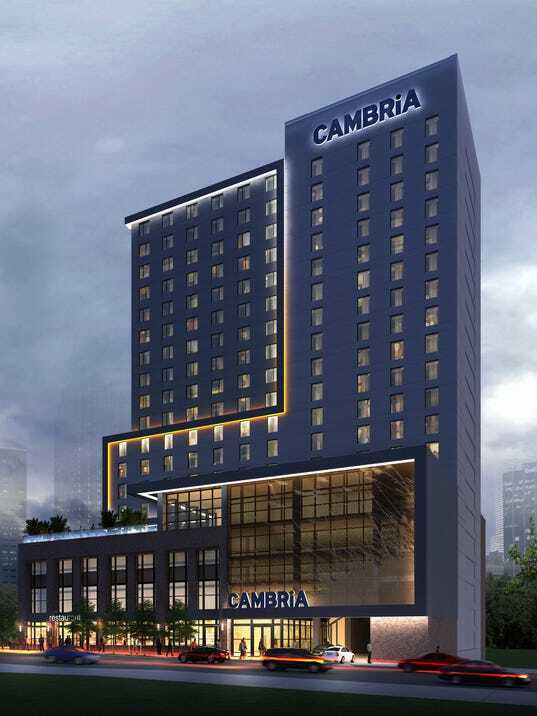 The Cambria-branded hotel — Choice's lifestyle arm that focuses on modern, experiential upgrades — will also include indoor/outdoor roof deck, complete with pool, a bar, gastrology lounge, a conference room with attached private kitchen and expansive views of downtown San Antonio. The only other Cambria hotel in Texas is located in Plano. REM purchased the site from Choice Hotels, which bought it about a year and a half ago with plans to move forward with a hotel development. However, those intentions disintegrated, and it decided to sell the site and bring REM on as the preferred developer. With an estimated 180 rooms, the Mayse + Associates-designed development is expected to break ground July 1. Following an 18-month construction period, REM is anticipating a delivery sometime in the fourth quarter of 2017. The Cambria hotel "will help the city get attraction in the center," Patel said. "San Antonio downtown has always been a high-demand hotel market, the lag has just been for development on the office side. This will focus on that." Last edited by babysal; Feb 26, 2016 at 9:47 PM. May the Schwartz be w/ U! Ladies and gentlemen, Cambria is simply a swanky Comfort Suites. I do not find it even on par with an Aloft or Element...even though they are all trying to capture the same target market. And, by most of "our" standards, this will not be a true "high-rise." This is a 181 Cambria built in DC. With the very small space this building will sit on, 180 rooms plus office and retail, I could see 15-20 stories or more. That's a highrise. On the business journal FB page it indicted 18 floors. With SA's lack of current "high-rise" height, this "18-story" development will be pretty prominent...and it's a "boutique" version of a Comfort Suites. I hope the design is similar to the one proposed for Washington. At least it will be more palatable...maybe. Look, I believe SA should be drawing in higher-end "boutique" brands and not celebrating lower-end ones. Or is that where we are??? Is that what we have to settle for??? I agree with you, I've been waiting for a W or Aloft downtown for years. That being said 18 floors isn't too bad. Personally I'm not too familiar with this brand as I prefer Starwood. But its movement in the right direction. It can and it will. You seriously need to stop with the incredibly negative perspective on everything. Seriously, no one is celebrating this development. They're just reporting on it and it's then being posted here. You're getting worked up over nothing just for the sake of it. 18 stories is a highrise, and in that spot, will make an impression. Especially, since it's replacing a one storing building that burnt down a few years ago. Here's one that's been approved in Nashville...this might give you a better idea of what might be proposed here. I'm pretty sure the building it will be backed up against is also about 18 stories, and it's an office building. So while this is good news, it probably won't stand out on the skyline in any meaningful way. If this is in reference to whR u said. I meant more so in terms of ground level and in comparison to the one story building that used to stand there. How anyone can take this news and turn it negative is bewildering to me. I agree, its a new development replacing a 1 story building as you stated. It's great news for downtown and progress. What's with the recent comments lately calling people out for being negative on the SA threads? Just because someone offers a different opinion or tries to see the project from another angle doesn't make their opinion negative. For example, I don't see how the comment about the building not standing out is negative, especially when the original comment explains that it is still good news. Of course the building will impact the streetscape but as a skyscraper forum the emphasis has usually been on skyline impacts and not street level impacts. So when someone on a skyscraper forum says that a building built up against a structure of similar height won't stand out they are making an observation that some may have overlooked. It seems that within the last few months people who offer opinions that are not the mainstream are getting overly criticized for them. As a forum we should be inviting others opinions and not criticizing them. Sure we can disagree but how about we try not to squash any outside thought, otherwise anyone with different ideas will stop posting and then we'll just get a forum of single thoughts. Now back to the proposed building. I really liked the original structure that was there before and with Main Plaza being right there I'm hoping they can bring a nice design to the area. Nothing crazy but I'm hopeful it won't be a flat box of a building. Maybe it can pay some homage to the original structure somehow. I like those designs in other cities and I almost always wants SA to get a cool modern building. But for some reason with San Fernando Cathedral, Main Plaza, and the Courthouse surrounding the space, this may be the one time where I'd be OK with a building that isn't all glass, for example. Sounded weird as I typed that haha. The "negative" comments sound like complaints. The development should be welcomed. Therefore, any "negative" comments sound like complaints and, yes, of course, you are entitled to your opinion. But, remember, the developers are professionals in what they do, and probably don't need any constructive criticisms from people in this forum. That is all people are trying to say to those people who insist on providing "negative" comments about developments and the city of San Antonio. Providing "positive" comments is always the best for "everything and everyone"!! Nobody here is commenting for the purpose of providing constructive criticism to real estate developers. I am commenting about new developments and how they are meeting my expectations, or failing to do so. I will not stop doing this, and I don't care at all how anybody else feels about it. Regarding this particular development, I am generally in support, given how little is known. Please don't be insulting. I said it was good news. I wasn't insulting you. The last sentence was in reference to another poster. This is spot on. Not everything has to redefine the skyline. Density is nice and ground level retail commitment is helpful. Getting rid of vacant lots and surface parking is always a good thing. With office vacancies (and prices) being what they are in DT SA (and with the promise of a TON of space showing up in the Frost Building), I would not be surprised to see the hotel side of this expand and the office side shrink. Still, will be interesting to see how this experiment goes for them. But, remember, the developers are professionals in what they do, and probably don't need any constructive criticisms from people in this forum. You are correct. Developers are professionals. And they will develop a property in any way they see fit to maximize their profits (or asset values). This includes design (amongst other items). AND, I can guarantee you those men an women developing these projects don't care one iota about what we, as forumers, feel about their developments (considering most are not even aware of SSP - or, at least, what is going on/being said on a daily-weekly-monthly basis). They are focused on far bigger things. I hope it looks like the one in Nashville. Good height, cute design.